Spring in Scotland can be an icy affair but I am always cheered by the bright crimson stems of young rhubarb even when its red contrasts the white of snow, as it did recently. Beyond the garden you’ll find rhubarb in country lanes and if you are fortunate, you may see sweet cicely Myrrhis odorata too. A member of the carrot family, sweet cicely has fern like leaves and umbels of small, cream blousy flowers. Bruise a leaf between a finger and thumb and you will smell aniseed. The carrot family has some toxic members but this simple, scented test will help you separate sweet cicely from the dreaded hemlock, which brought about the demise of Socrates. Hemlock has a blotchy red stem. 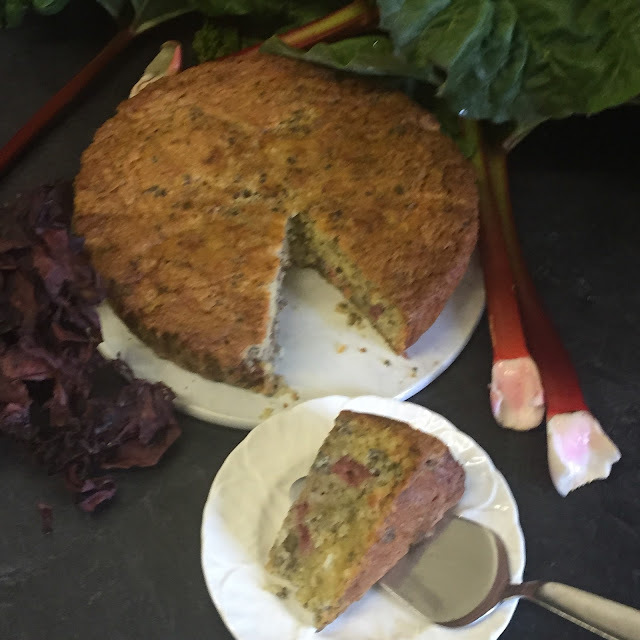 When successful identified, sweet cicely marries well with rhubarb in the kitchen and you may find that it enables you to add fewer grains of sugar too. Sweet cicely is a natural sweetener. 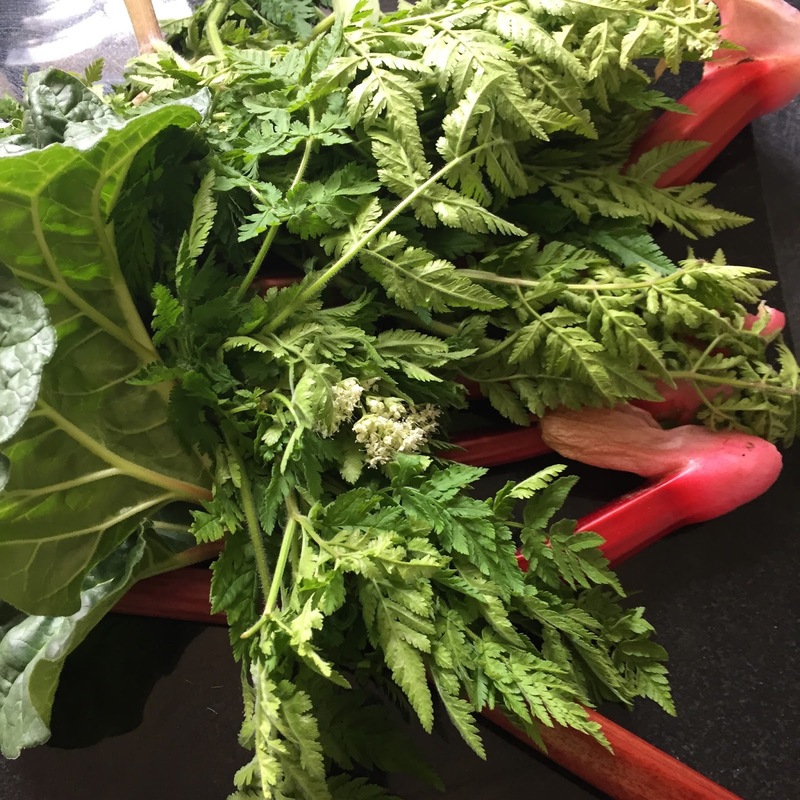 You’ll find a recipe for sweet cicely and rhubarb sorbet in The Forager’s Kitchen. Poach sweet cicely with rhubarb and chop some leaves into a crumble topping or add a handful to a spring summer pudding. Sweet cicely can be infused in custard and works well with fish, chicken and spring greens too – add sparingly or liberally to suit your taste buds. Think aniseed. One of my favourite spring smoothies combines sweet cicely infused rhubarb puree with oats, orange juice and unsweetened yoghurt. Seaweed is seasonal too and one species that has been used in coastal cooking for generations is dulse Palmaria palmata. 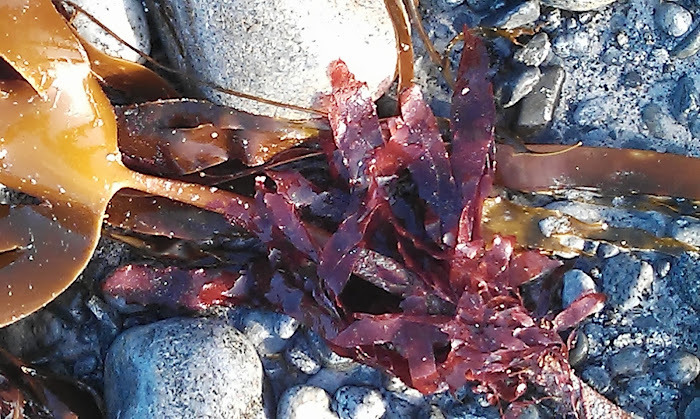 This wine red seaweed grows as an epiphyte on forest kelp (Laminaria hyperborea) but is also found on rocks at low springs tides. Like many seaweeds it’s a kitchen chameleon and changes colour when cooked, in this case from red to green. ‘Pick your own’ dulse stores well when dried, but it can be purchased in supermarkets or direct from seaweed harvesters. Dulse and rhubarb combined in a sauce cuts into oily fish or adds interest to a compote. You’ll find more dulse recipe ideas in Seaweed in the Kitchen. Cut the rhubarb into 2cm small bite size pieces and pop them in a colander. Rinse under cold water. Put the rhubarb in a bowl. Sprinkle the icing sugar and dulse into the bowl, mix briefly and leave to macerate for 30 minutes. Line a 23cm loose bottomed cake tin. In a mixing bowl cream the caster sugar and butter together and beat in the eggs. Add a spoonful of flour with the last two eggs to prevent curdling. Fold in the remaining flour, baking powder and rhubarb and dulse and pop the mixture into the prepared cake tin. Bake in the pre-heated oven. After 45 minutes pop a piece of foil over the cake. Continue cooking for another 15 minutes and then test that the cake is cooked by putting a skewer into the centre. If the skewer is clean when removed the cake is cooked. If not, cover the cake with foil and return it to the oven for 10 -15 minutes and test again. Leave the cake to cool in the tin and then turn it on to a wire rack. Sprinkle with sifted icing sugar before serving.